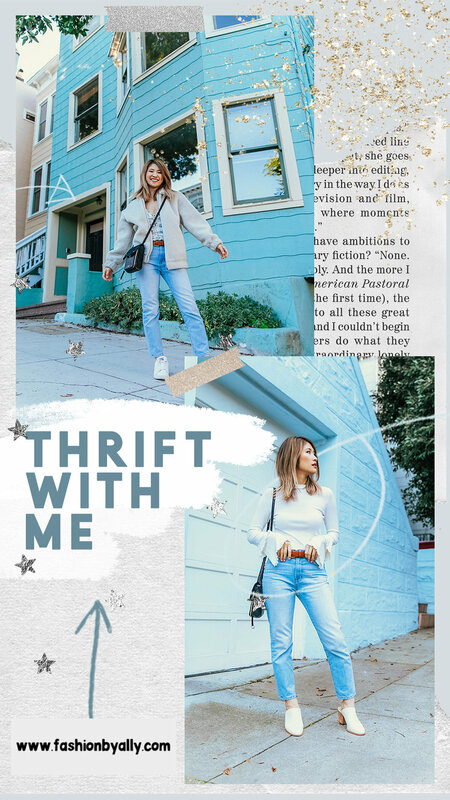 Come thrift store shopping with me for Spring! A personal goal of mine is to practice more sustainable shopping for fashion. An easy way to refresh my closet without hurting the environment is by purchasing from my local thrift / consignment shops. Here are a few tips to keep in mind when going thrift store shopping for the first time! It is easy to get overwhelmed in a thrift store. Compared to traditional shopping, items may not be as organized or categorized as neatly. Come prepared with a shopping list and look through several racks before finding an item that sparks joy! You might come across an item with a tear, missing button, or stain! Don’t worry, nothing a needle and thread can’t fix! If you truly love an item that isn’t your size, use your crafty skillz to fix it up! For instance, this Madewell skirt was only $6, but is one size too big. Luckily, the wrap skirt style is easily adjustable and can be tied tighter around my waist. Some thrift stores allow you to sell your clothes for cash. At Buffalo Exchange, you will receive 30% cash or 50% store credit for the selling price of an item. If you have trendy clothes you no longer love, why not trade it in for a pre-loved item? Check out my Spring Thrift With Me video for more tips and tricks! See what I ended up purchasing and my selling experience in San Francisco. What are some of your favorite thrift stores and thrifting tips?